Hosmer is a six-month-old Boxer who gets a little rough and exctited when seeing other dogs when he is on the leash. His guardians mentioned that outside of the other boxer they had (who recently passed) Hosmer didn’t get a ton of socialization with other dogs as a puppy. Despite not getting a lot of socialization experience as a pup (Something no-0ne reading this should skip out on with a new pup. Its time you will never get back), Hosmer had a really beautiful energy; playful, inquisitive, energetic, but with a gentleness that is unusual for a boxer (as they are known to be very bumpy and physical when playing). I sat down with Hosmer’s guardian to discuss his day-to-day life and find out what sort of rules and structure they had in place. As is frequently the case with my clients, Hosmer really didn’t have many rules. Because dogs go through life probing and waiting to be corrected to find boundaries, we do them a disservice when we don’t have clear rules and structure in place. Typically what most people do is allow the dog to continue engaging in an unwanted behavior until the human can’t take it anymore. At that point the human erupts, telling the dog to stop whatever it was doing. But to the dog, whatever it’s been doing has been OK because the human hasn’t disagreed up to that point. By correcting the instant a dog does something, its able to associate the two. I suggested that moving forward Hosmer’s guardians disagree with him the instant he starts to engage in any unwanted action or behavior. I also suggested a few simple rules that they can incorporate that will help redefine the leader follower dynamic in the home. Things such as asking a dog to sit before you let it outside or making furniture off-limits can have a long lasting impact on how a dog sees itself in conjunction with its humans. Because the height that a dog sits that has a direct correlation onto its rank amongst the members of the pack, allowing Hosmer to sit on a specific piece of furniture was confusing. To the dog, if he is allowed on one piece of furniture of a certain height, he should be allowed on all pieces of furniture of that same height. But in Hosmer’s case, his guardians only wanted him to use one chair on the other side of the room. In addition to being confusing for the dog it also gives him the wrong impression; that he has the same rights and authorities as the humans. To help change that perspective I suggested that they make all the furniture off-limits and showed them how to condition Hosmer to use the dog bed on command. It shouldn’t take long for Hosmer to start going over to the dog bed on his own. This doesn’t mean that he’s going to give up on trying to get on the furniture as it does give him status. I suggested that his guardians immediately disagree with him anytime he jumps up and if possible to anticipate when the dog intends on climbing on the furniture. Disagreeing with the dog before it engages in an unwanted action or behavior is an extremely effective way to communicate boundaries with your pet. To help Hosmer’s guardians better communicate with their dog, I went over some nonverbal communication cues and a set of escalating consequences that I like to apply. If Hosmer’s guardians practice using these escalating consequences over the next week or two, they should become a habit for them. Once this is the case his guardians will be get into a habit which will enable them to be able to communicate with their dog nonverbally without even really thinking about it. Next I wanted to tackle Hosmer’s fear of the kennel. I had his guardian show me where it was. The location of the kennel is often a part of the reason that the dog does not like going inside. It was placed in the laundry room which is away from where the family hangs out. While having a kennel in a sub room such as this can be better for a home’s aesthetics, it can often be interpreted as a punishment by the dog. Dogs are extremely social creatures. In fact really one of the worst punishments to a dog is to be excluded from the group. While relocating the kennel to a common room can certainly help, it’s usually not the only issue in a kennel fear situation. I noticed that Hosmer seem to pause or pull back each time that he stepped onto the plastic flooring on the bottom of the kennel. It made a clanky sound when he stepped on it. Sounds can be a strong distraction for many dogs and they can quickly become associated with a negative stimulus. I had his guardian grab me a towel and I placed it underneath the plastic tray so that it silenced the clanging of the tray against the bottom of the kennel. After dispatching the problem with the distracting sound, I showed his guardians how to condition Hosmer to look forward to going inside the kennel. It will take a few days to a week or so before Hosmer becomes fully comfortable with the kennel. The more often that his guardians practice this exercise and leave desirable items such as new toys, bones, antlers, etc will impact the speed of this transition. To help the guardians practice using the escalating consequences and new communication methods that I introduced earlier in the session, I demonstrated a leadership exercise I developed a few years ago. The exercise helps a dog practice restraining itself while looking to his guardians for leadership. It only took me two times before Hosmer seemed to understand what I was asking from him. At that point I started coaching his guardians to the exercise themselves. After the leadership exercise, I fitted Hosmer up with a Martingale collar and showed his guardians how to apply the special twist to the leash. As usual, the Martingale had a dramatic impact on stopping the dog’s pulling. Unfortunately there were not any dogs in the neighborhood while we were out for our walk. Instead I went over how to correct the dog when out of position and some simple rules for the walk. With most of my clients, fixing how the dog behaves inside has a dramatic impact on how it reacts outside of the home. I’m guessing that will be the case with Hosmer. If not, I instructed his guardians to contact me to schedule a follow-up session to work specifically on his reaction to other dogs. By the end of the session, Hosmer was behaving beautifully. He no longer invaded his guardians personal space, he was listening to their commands and corrections and was already following the new rules on his own. Additionally he had really taken to his new doggy bed in the living room. He probably took to the new methods and exercises better than almost any other dog I have ever worked with. 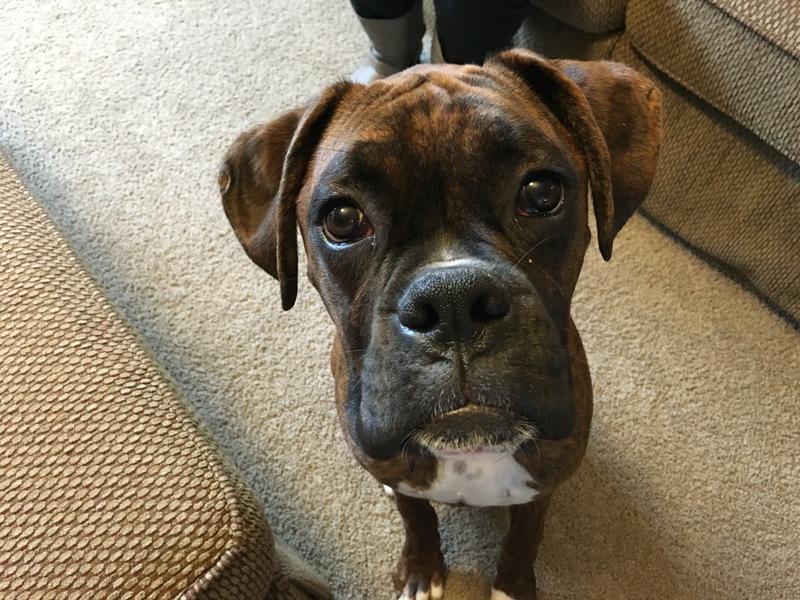 Because Hosmer sincerely wants to make his guardians happy and they are dedicated to raising a well-adjusted dog, I don’t expect it to take long before Hosmer is one of the most well behaved boxers in the Midwest!